The last couple of months have been difficult for running. Since I had my toenails removed, I have been experiencing pain along the inside (medial) aspect of my right leg. One doctor thought it might be tendonitis and might have been caused by not resting long enough after having the nails removed. Of course, this opinion was rendered in the surgeons lounge and basically consisted of me telling him I thought I ran too soon after removing the nails and stressed something. I had a lump on my leg. When he pushed on the lump I had pain. Tendonitis. This made sense to me; I ran three days after I had the toenails removed, and while the nails have given me no problems since their removal (until they grew back and turned purple again!) I figured I probably changed my stride without even realizing it, which may have stressed the tendons. Two months later, the pain is getting no better. My mileage is down and my pace is at least a minute longer, sometimes more, than what I usually run. Ice and Ibuprofen helped to a certain degree. I delayed going to the doctor. Basically, I knew what the quack was going to say: Stop Running. For awhile. Three days for me is awhile. Six weeks–I may as well just slit my wrists. Well, long story short (too late!) I ended up getting an MRI. 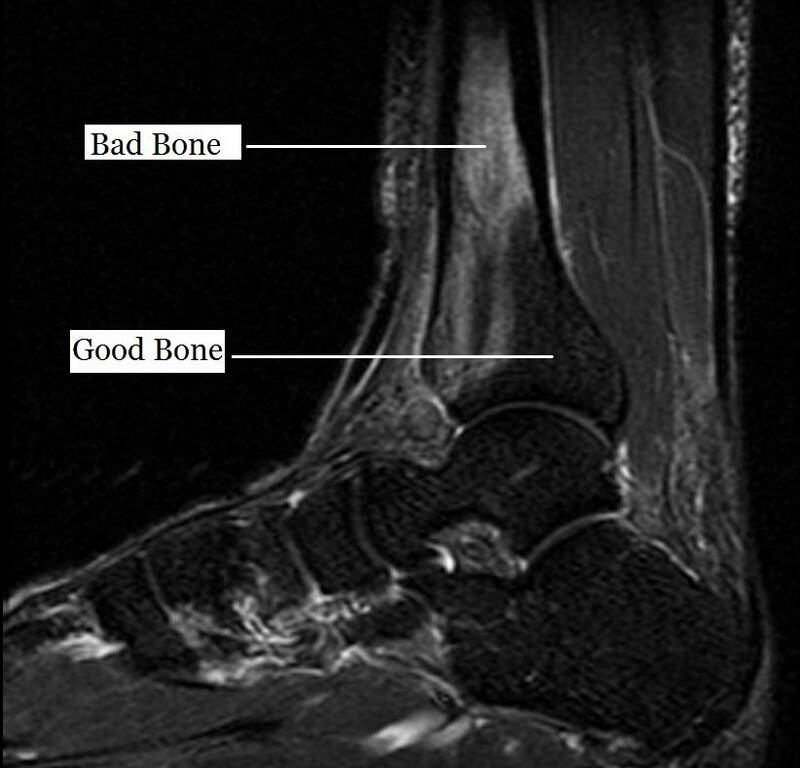 My tibia is cloudy–there is edema or swelling indicative of a tibial stress reaction. This differs from a stress fracture in so much as they don’t actually see a fracture. The doctor told me to stop running for at least six weeks. I asked if I could get another opinion. He told me my nails were ugly too. So what am I supposed to do for SIX freaking weeks. He told me to try swimming. I actually enjoy getting in our pool–after I run. It helps me cool off! But enjoying the pool for me involves laying on my inflatable Penn State raft and tanning. 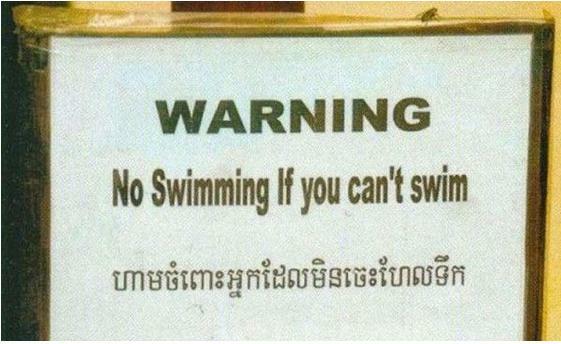 So send the guy with the gimpy leg into the pool. Is he trying to drown me? I could take up the stationary bike. I don’t know where I’d take it, because I hate that. I hate indoor exercise of any sort, unless it involves typing on my computer. My family is taking bets on how long I will be able to last. Today is ONE WEEK. I swam thirty laps in the pool without dying, but I did get a Charley horse in my other leg. Great! Now I won’t be able to walk! 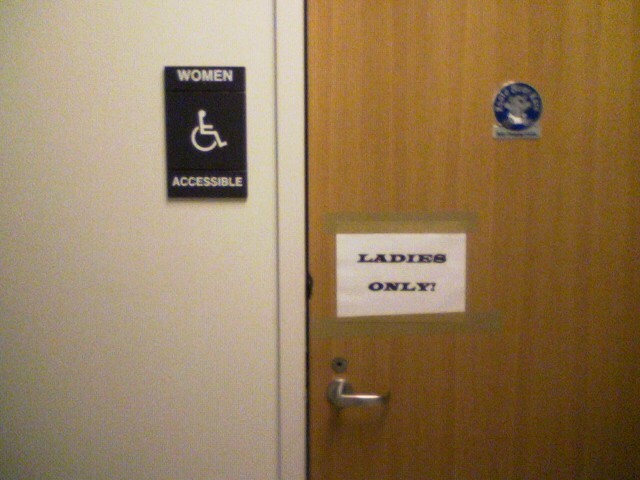 I guess I’ll just have to ride my stationary bike . . . to NOWHERE! I’m betting that I won’t make six weeks. It might come down to choosing between leg pain and losing my mind. And I don’t have much left to lose! Perhaps it might be deemed unprofessional for a doctor to talk about his patients in a public forum–and certainly, if I were to divulge personal information it would be a violation of ethics and a HIPAA violation–but studying the doctor-patient relationship in general can be enlightening. And amusing. Early on in my career–as a medical student as a matter of fact–I was interviewing a patient admitted to the hospital. I had on my short white coat, stethoscope jauntily draped across the back of my neck, a blank history and physical form which I needed to complete and the patient herself. I was tanked up on my second gallon of coffee for the day and steeling myself for what was then an intimidating encounter. After all, I was a third year medical student–NOT A DOCTOR. But I was expected to act and perform like one. As part of the history and physical, we ask questions regarding general health, that may be completely unrelated to the problem for which a patient is admitted. It is called a Review of Systems. The textbooks and mentors try to teach us to be thorough–you never know what seemingly unrelated symptom may provide a clue for the real diagnosis. And the best way to be thorough is to be systematic. So as I went down the list of questions . . . do you have headaches? Do you have sinus problems? Any vision problems? And so on. I came to the auditory system. “Do you have any trouble hearing? I kept my nose down in my notes. Bedside manner is a fourth year elective. Actually looking at the patient at this point in my training might have made my head explode. I repeated the question, louder. I asked her a third time, even louder than before. Now remember, I had already asked her questions in a normal voice and she answered. She was obviously joking around with me, but I hadn’t realized that at this point. Fortunately for me, she started to laugh and I realized what she was doing. I hope it made her feel more comfortable, because it didn’t do much for my confidence. Another patient–in my internship year–called at 2:00 AM (that is early in the morning in case you didn’t know) and told me that he had dropped an aspirin tablet on the floor. Could he still take the pill? I’m pretty sure the three-second rule applies here. Apparently germs and dirt need more than three seconds to invade any object dropped on the floor. Was it covered in dirt or lint? Could it be washed quickly and then taken before it dissolves in your mouth and not in your hand or in the sink? Do you have enough in the bottle to simply sacrifice this one tablet and take another? Do you know what freaking time it is????? As an ophthalmologist, I don’t get many of those calls anymore, but I still deal with people. 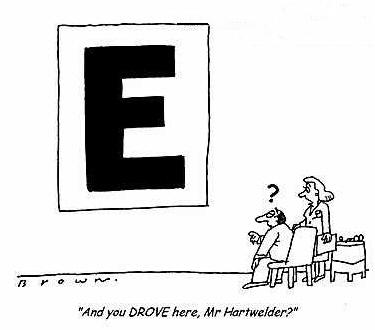 I had a patient with cataracts and I asked him if he had any trouble driving at night? His vision was actually not good enough to pass a drivers test for night driving, and after looking at the cataract, I couldn’t believe he could see well enough to drive at night. It’s all in how you ask the question. 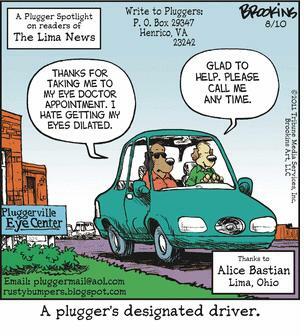 I guess it isn’t a problem to just give up driving. Another gentlemen told me that he was able to read without any problem. 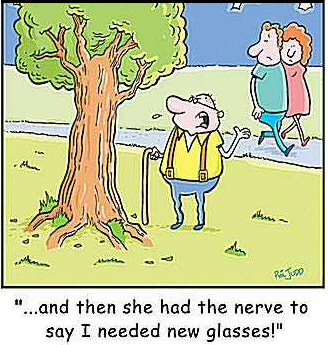 His distant vision was fine, but he was at an age when reading glasses or a bifocals would have been necessary. I queried him again. 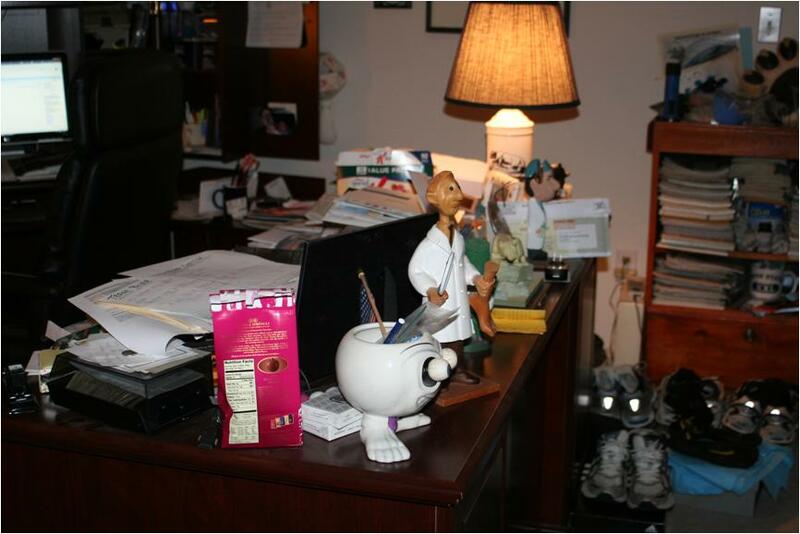 Again, he insisted he could read and he reads the newspaper every day–without glasses. So I went out to the waiting room and brought back a newspaper. I asked him to read it for me. This man stands up out of the chair, unfolds the newspaper, and lays it on the floor. He then stands over it and starts reading the paper. I guess he doesn’t have a problem after all! I guess her sugars weren’t as good as she thought they were. Maybe there’s a reason your doctor’s yelling at you. But most encounters go well. It’s always nice to give patients a good report, especially when they have diseases which could adversely affect their vision. “Everything looks good,” I’ll say cheerfully. Thanks to the dilating drops and the bright lights we shine in your eyes, if you didn’t have trouble when you come in, you have trouble when you leave. But that will go away shortly. You just have to have some patients. Pennsylvania, Pennsylvania! Rock Me, Pennsylvania. I felt the earth . . . move . . . under my feet. So far this year, I have survived a haboob and an earthquake. And with Irene making its way up the coast, I may be able to add a hurricane to my weather world bucket list. The storms of the year trifecta. WooHoo! I was in my office. I had just finished examining a patient, when things started to shake, rattle and roll. (Thank God I wasn’t in the middle of surgery!) It was like a locomotive roaring by outside–only you couldn’t hear a locomotive . . . and there are no train tracks near my office! I look at the patient. He looks at me. We both look at his wife, sitting in the corner behind us. Yes. We felt an earthquake. In Pennsylvania. I have lived, um, well at least 39 years in either Pennsylvania or Ohio, and I have never felt an earthquake. Not even a tremor. Unless there’s a train lumbering past. Maybe an occasional charley horse. So I called my wife. Apparently, it did not. She was cleaning. The vacuum was running. The washer was running. She thought she heard the wall shaking–our vinyl siding shakes in the winter time when the wind gusts–and while she thought that was odd since it wasn’t winter, she hadn’t realized what was happening. That’s probably a good thing. Weather disasters like tornadoes and hurricanes and snow freak her out. It was better this way. I surveyed the damage when I got home. What a mess it made of my desk! Here’s what it looked like before . . . Going to the beach these days can be a trying ordeal. Forget the humiliation of wearing a bathing suit or the experience of sand where you never thought you could get sand. Like every other aspect of our lives in this “free” country, there are rules. 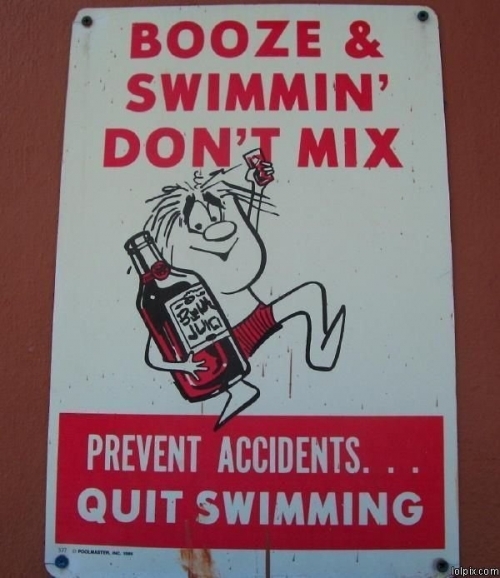 No alcohol on the beach. Who came up with that one? 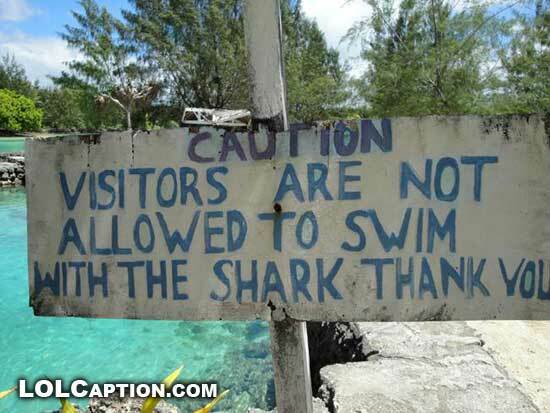 No swimming with the shark? Here’s your sign. 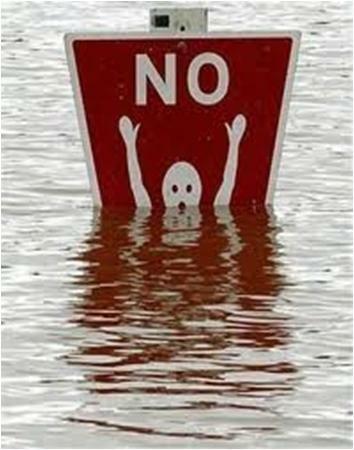 Do we even need a sign for this? What’s the fine for drowning??? I guess this wasn’t a misprint. But as I lay on the beach, basking in the sun and wondering how I am going to get the jellyfish out of my pants, I happened to notice the lifeguard waving orange flags wildly. I had noticed this behavior earlier when I had been out in the water. The lifeguard would blow his whistle and wave his flags for swimmers to move to safer areas. At least, I think that’s what he was doing. In the ocean, without my glasses, I couldn’t really tell what he was doing. He might have been pointing at me for all I know. My ears are better. He should have used a bull horn–‘hey, you. Yeah, you, the one who’s almost drowning. Stop that!’ But now he appeared to be waving frantically at the next lifeguard up the coast. What is he doing? Is he trying to signal the next lifeguard to steal second base? In an age where my daughter can sit at the table and text her friend sitting at the other side of the table, is this the best we can do in life saving communication? Flag waving 101? Apparently the lifeguards use this form of communication to pass information along the beach from one lifeguard station to the next. What does that sound like to you? It sounds like a game of telephone. One message handed down the length of the beach. But what if there is an emergency? How does the next life guard even know that the other guy is trying to signal him? I guess that’s what the whistle is for. Unless he’s whistling at me before I get sucked out to sea. 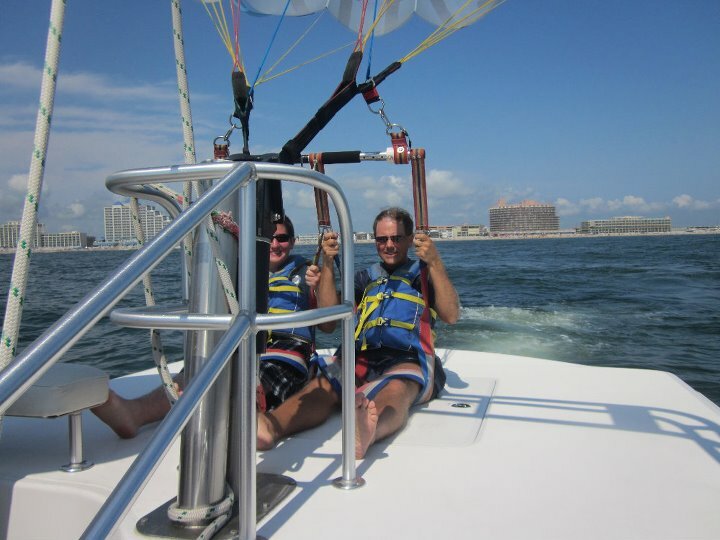 While vacationing in Ocean City, Maryland last week, I had the opportunity to go parasailing. 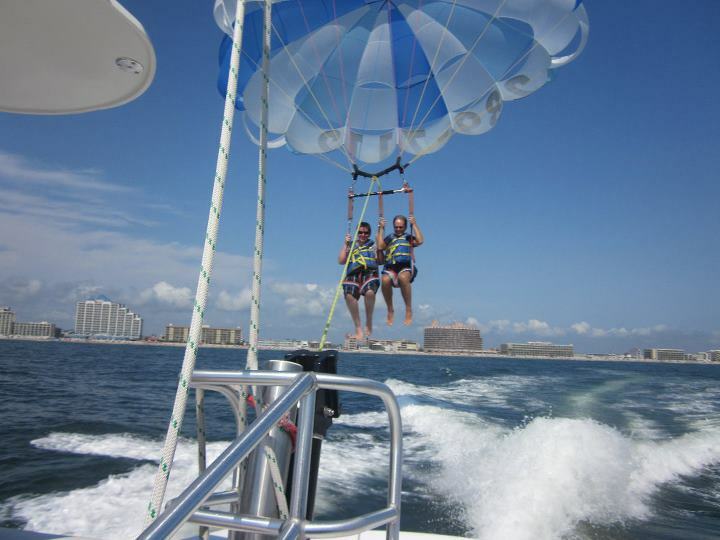 Basically, parasailing is an activity–I can’t really call it a sport–whereupon one is suspended in the air by a parachute while being pulled along by a boat down below. Who comes up with this stuff?! In this case, two people are strapped into the parachute so you can share the fear fun. We had an option of being flown at 400 feet, 600 feet, or 800 feet, the basic difference being about 20$ per 200 feet. 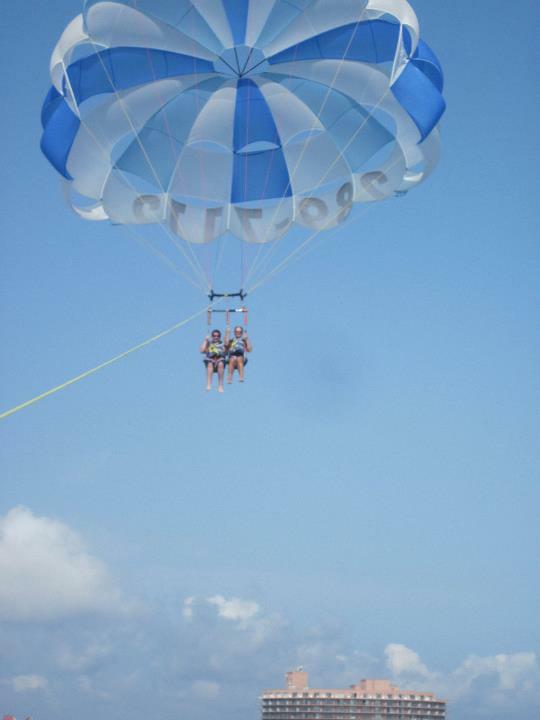 My family, being parasailing virgins, opted for the basic 400 foot level. 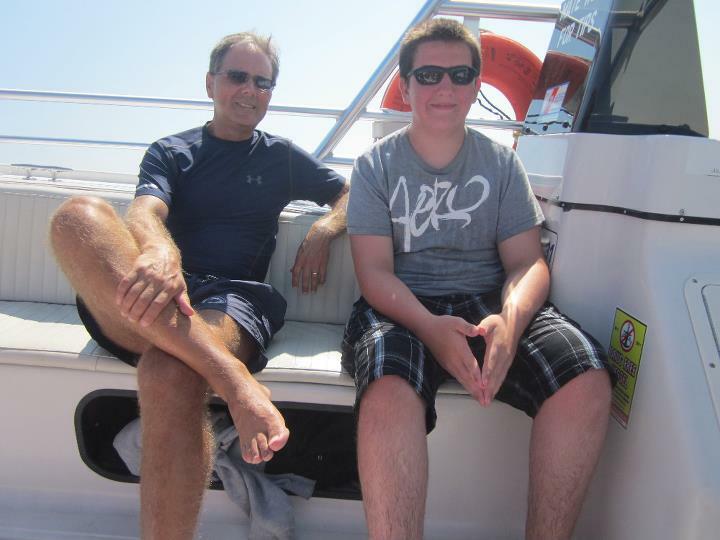 So here I am in the boat, with my son. Note how relaxed I am. I am on vacation after all, and the credit card bill won’t be due for another cycle. 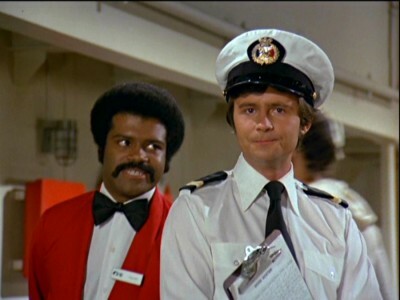 Then the first mate–there were only two crewmen on board, and since this guy wasn’t driving, I assume he was the first mate. Maybe he was Isaac the bartender. Or whatever the heck Gopher was. Either way, he worked for tips, or so the sign said. I’m thinking, my life is in this dude’s hands . . . maybe I should tip him well NOW, before I’m four hundred feet above the boat! Trust us . . . with your LIFE! 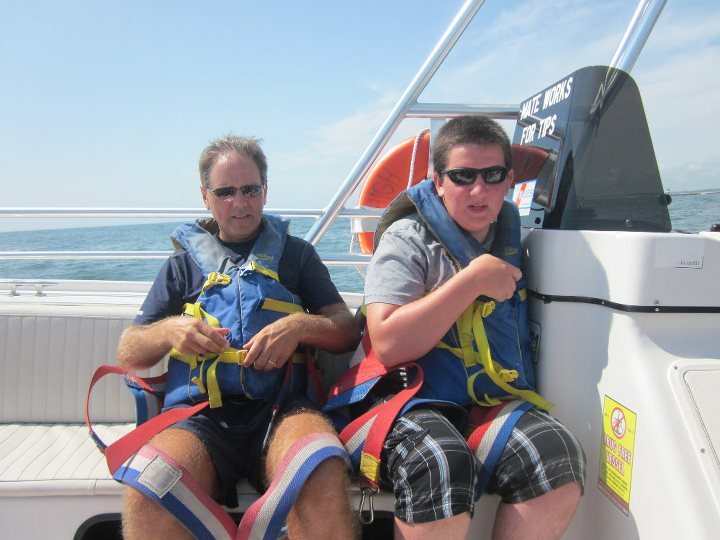 Anyway, he handed us straps and a life vest to don. Don we now our sail apparel . . . Fa, la, la, la, la, la, la, la, la! Insert Tab A into Slot B? The strap thing wasn’t terribly complicated. But then, do I really want my life to depend on something SIMPLE? This couldn’t possibly be foolproof because fools like myself are too darned ingenious. I manage a weak smile for the camera. It might be the last photo of me taken while I’m still alive. Are there sharks in these waters? Angry dolphins? What about vultures? Or pterodactyls? I should have listened more carefully when they explained how to arrange the straps so that you don’t get a wedgie. The rope tethering us to the boat didn’t look very thick. The knot looked like something I would tie–it could pop loose at any second! Worse yet, my younger son had been fighting with his brother this morning, and I think I can see him down there trying to saw through the line with a knife. Sure, he’ll get back at his brother. I’m just collateral damage! 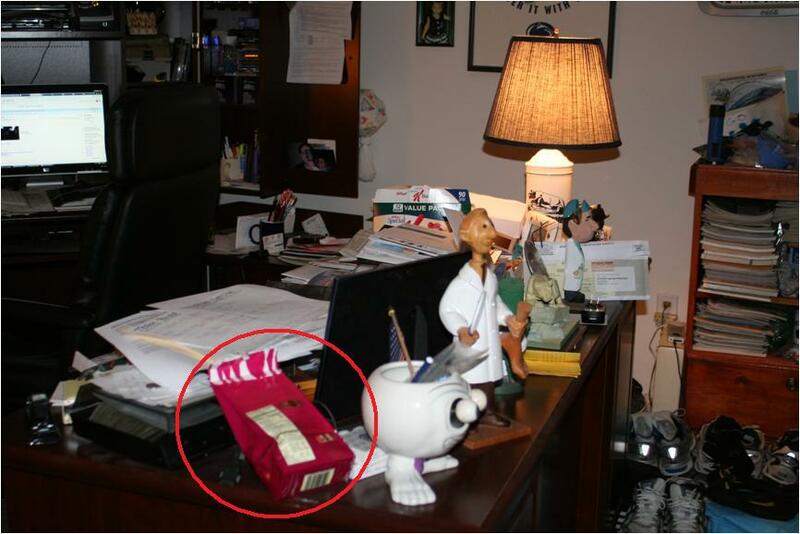 Thank God, but I think it’s just a butter knife!